Dr Sophie Williams with Shaun Russell (Director) and Natalie Chivers (Curator) of the Treborth Botanic Garden, Bangor University, after cutting the ribbon at the Moongate entrance to the new Chinese Garden. 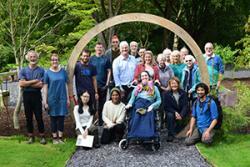 During the 2016 summer vacation at Bangor University, Treborth Botanic Garden hosted a visit by Dr Sophie Williams and her partner Robert, with staff from Ysbyty Gwynedd’s High Dependency Unit. Dr Williams (32) is continuing on the road to recovery after contracting the viral brain infection Japanese Encephalitis, while on a research project in southern China during 2015. 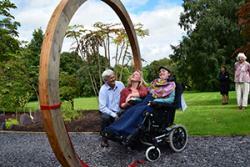 Sophie cut the ribbon on the ‘Moongate’ entrance to the Chinese Garden, which is a newly-developed area of Bangor University’s Treborth Botanic Garden facility. The Moongate is a traditional feature of Chinese gardens and has been constructed out of seasoned larch wood by local craftsmen in North Wales. The Chinese Garden at Treborth is open free-of-charge to the public and is being developed to showcase the rich diversity of plant species from China, including those used in traditional Chinese medicine. The Garden also has a Lily Bowl water feature and handcrafted oak-wood benches, and will help to promote greater awareness of Chinese culture and botanical history. The Garden is part of a collaboration between Treborth Botanic Garden, the Xishuangbanna Tropical Botanic Garden in China, and the Royal Botanic Garden in Edinburgh, with funding from the Confucius Institute at Bangor University. This initiative is part of the “Two Dragons Garden Project” (the name refers to the national symbols of Wales and China). The wider aim of the project has been to develop innovative training programmes for graduating students to gain work experience in botanical gardens in Wales and China, and to help them and others into gainful employment and career progression in the horticulture and environmental education fields.